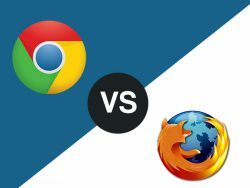 Web Browsers: Chrome or Firefox? One of the most common causes of accessibility problems with Library online resources is web browser incompatibility. The librarians and staff regularly receive calls from students unable to view or download full-text articles or view online video. Often a simple change of web browser solves the problem. Both Microsoft’s old Internet Explorer and new Edge browsers are problematic and are not recommended for searching and retrieving Library resources. All Library users should have both Mozilla Firefox and Google Chrome installed on their computers. Unfortunately, at this time, it is not possible to recommend one browser for all research needs. Some article, ebook, and video databases work better with Firefox and some better with Chrome. In November 2017, Mozilla released its “Quantum” version of Firefox. The old version seems increasingly susceptible to problems, so if you haven’t already, be sure to install Quantum; like all Mozilla programs, it’s completely free. A note to Safari users: Apple’s Safari browser appears to work well with Library databases, but we still recommend keeping both Firefox and Chrome on your computers. This entry was posted in Research Tips and tagged apple safari, google chrome, microsoft edge, mozilla firefox, web browsers on July 25, 2018 by Harold Henkel.